We have been working on stripping the paint from our mantel in the den over the last few weeks. The mantel piece was pretty loose so we decided to take it off and reattach it properly. Behind the mantel there was a little space where objects had rolled back into. 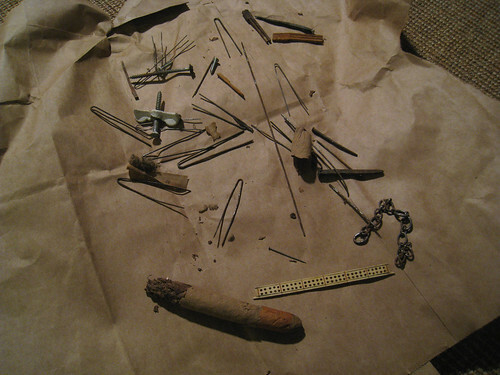 The area was full of hair pins, real wood matches, the smallest nails we have ever seen, and an old cigar. In the foreground of the top photo check out the strange plastic stick with numerous holes. No idea what it could be? We trying to figure out a date on the objects. 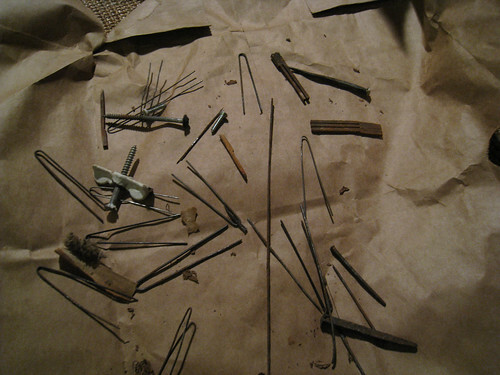 I guess if I found out when they made real wood matches maybe I could date the other objects? Love your blog! I stumbled upon it while "googling" for hex floor tile for our bathroom. :) We are having a white bathroom delima as well in our old house. When painting and caulking the mantle around our fireplace I found some old Valentines from 1924 that slipped between the wall and the mantle. We are still looking for the money hidden in the walls. ha! It's definitely a cribbage board, and most likely not plastic but ivory, or given your house's history, whale bone. Making one was a common pastime for sailors on long voyages. Have you ever seen the HGTV show "If These Walls Could Talk?" You could be on it!